9rules is a community of the best weblogs in the world on a variety of topics. We started 9rules to give passionate writers more exposure and to help readers find great blogs on their favorite subjects. It’s difficult to find sites worth returning to, so 9rules brings together the very best of the independent web all under one roof. It was a great honour to be accepted, given the quality of the other blogs involved and the number that applied during the 24 hour ‘submission window’. I remember sitting in a coffee shop on Lothian Road in Edinburgh having taken my laptop away on holiday purely to do the 9rules submission at the right time: some ‘recognition’ on this level meant a lot to me, and it still does. And the site’s got a lot of new readers through 9rules: the start of every new post appeared, within a couple of hours, in both the ‘Design‘ and ‘Technology‘ feeds on the 9rules site, and a lot of people clicked through to read the full things, and then (often) stayed to read other posts. Equally, I found some truly amazing new blogs and interesting voices through perusing other members’ feeds: there is a wealth of passionate talent and opinion out there, and 9rules’ members never failed to impress. To a large extent I was a passive consumer of what 9rules brought me; I didn’t get involved with the ‘my.9r‘ social networking feature of the site, nor write any ‘Notes‘ (if I’m going to write something intelligent, I’ll write it on the blog, was my reasoning, but I certainly read a number of interesting discussions in the Notes section, and enjoyed doing so). Let me be clear — participation in either the new member area or my.9rules is required for all members, requested by members. I understand what she’s saying, and I’m not going to argue – but it’s a shame: forced participation would certainly “become a chore” and I’m not going to agree to commit to anything along those lines (I wonder how the level of participation will be measured or assessed? ), so this site will be leaving 9rules, sadly, in due course. Taking a broader view, in internet terms, 9rules’ move – to more of a ‘walled garden’, turned in on itself – seems very much at odds with the increased openness which has driven the dramatic growth of, say, Facebook. Perhaps 9rules wants ‘quality’ rather than ‘quantity’, but defining ‘quality’ as ‘frequency of participation’ seems to be rather arbitrarily quantitative, if that makes sense. I’m not sure there’s actually any correlation between time spent on interactive banter within a closed community, and creating worthwhile blog content that people want to read: it would seem that time spent on one precludes spending time on the other. I hope some of the readers who originally found this site through 9rules will continue to read it (the RSS/Atom feed links are in the sidebar on the right), and I thank 9rules for the extra exposure it gave this site during my time as a member. A couple of recent stories on photography of certain items being ‘banned’ – Cory Doctorow on a Magritte exhibition’s hypocrisy, and Jen Graves on a sculpture of which “photography is prohibited” – highlight what makes me tense up and want to scream about so much of the ‘intellectual property debate’: photons are no more regulable than bits. And bits, like knowledge itself, aren’t regulable either (Cory again). Just as he who lights his taper at mine, receives light without darkening me, so he who receives an idea from me, receives instruction himself without lessening mine (Jefferson, via Scott Carpenter). Image from an ACID leaflet, “You wouldn’t say that copying was the sincerest form of flattery if it cost you your business”. The sign doesn’t seem to be shown on ACID’s Deterrent Products online store. I understand what ACID is trying to do, and unlike most anti-copying initiatives, ACID is set up specifically to protect the little guy rather than enormous intransigent oligarchies. ACID’s sample legal agreements and advice for freelancers on dealing with clients, registering designs, etc, are great initiatives and I’m sure they’ve been a fantastic help to a lot of young designer-makers. But a sign ‘banning’ photography at exhibitions? At design exhibitions where new aesthetic ideas are the primary reason for most visitors attending? That seems hopelessly naïve, akin to a child defensively wrapping his or her arm around a piece of work to stop the kid at the next desk copying what’s being written, but then pleading with teacher to put it up on the wall. And I would have thought, to be honest, that “with phone cameras your ideas… [being] sent globally within seconds” is more likely to lead to instant fame and international recognition for the designer on sites such as Cool Hunting, We Make Money Not Art, or Core77 than (presumably unauthorised) “mass production”. But maybe I’m wrong: I’m sure you’ll let me know! Most young designers are desperate for exposure. I know every design exhibition I’ve shown stuff at (not many, to be fair), I’ve been delighted when someone photographs my work. ACID’s sign also raises the question, of course, whether when someone displaying the sign actually sells a piece of work, it comes with a label attached telling the purchaser than he or she may not photograph it, or show it to friends. Wouldn’t that be a logical extension? It won’t be too long (20 years?) before photographic (eidetic) memory and computers start to overlap (or even interface), to some extent, even if it’s only a refinement of something like the Sensecam. What’s going to happen then? If I can ‘print out’ anything I’ve ever seen, on a whim, why will I worry about what anyone else thinks? Many of the tens of thousands of products displayed last week on the Vegas expo floor, as attractive and innovative as they are, are designed to restrict our use… Even children are bothered by the increasing restrictions. One electronics show attendee told me his 12-year-old recently asked him, “Why do I have to buy my favorite game five times?” Because the company that made the game wants to profit from each device the user plays it on: Wii, Xbox, PlayStation, Game Boy or phone. At this year’s show, the president of the Consumer Electronics Association, Gary Shapiro, spoke up for “digital freedom,” arguing that tech companies shouldn’t need Hollywood’s permission when they design a new product. The Consumerist – showing a 1981 Walmart advert for a twin cassette deck – comments that “Copying music wasn’t always so taboo”. I’m not sure it is now, either. George Preston very kindly reminds me of the excellent Trusted Computing FAQ by Ross Anderson, a fantastic exposition of the arguments. For more on Vista’s ‘trusted’ computing issues, Peter Guttmann has some very clear explanations of how shocking far we are from anything sensible. See also Richard Stallman’s ‘Right to Read’. …Architects hit a snag when they realized too much visibility could create problems. To minimize unwanted visibility, the design team applied a reflective film to all the windows facing the wards. Deputies can see out, but inmates cannot see in. Much like the 18th-century Panopticon, the El Paso County jail design keeps inmates from seeing who is watching them. Should the iPhone be more open? Steve typed “Sounds great. See you there.” 28 characters, 28 bytes. Call it 30. What does it cost to transmit 30 bytes? * iChat on my Macbook: zero. * iChat running on an iPhone using WiFi: zero. * iChat running on an iPhone using Cingular’s GPRS/EDGE data network: 6 hundredths of a penny. * Steve’s ‘cool new text messaging app’ on an iPhone: 15c. A nickel and a dime. 15c for 30 bytes = $0.15 X 1,000,000 / 30 = $5,000 per megabyte. “Yes, but it isn’t really $5,000,” you say. It is if you are Cingular, and you handle a few billion messages like this each quarter. … [I] assumed that I would be able to install iChat myself. Or better still Adium, which supports AIM, MSN, ICQ, and Jabber. But I will not be able to do that because … it will not be possible to install applications on the iPhone without the approval of Cingular and Apple… But as a consumer, I have a choice. And for now the ability to install any application that I want leaves phones powered by Windows Mobile, Symbian, Linux, RIM, and Palm OS with some major advantages over the iPhone. Aside from the price discrimination (and business model) issue (see also Control & Networks), one thing that strikes me about a phone with a flat touch screen is simply how much less haptic feedback the user gets. I know people who can text competently without looking at the screen, or indeed the phone at all. They rely on the feel of the buttons, the pattern of raised and lowered areas and the sensation as the button is pressed, to know whether or not the character has actually been entered, and which character it was (based on how many times the button is pressed). I would imagine they would be rather slow with the iPhone. They’ve got quotes from the BPI, AIM, FACT and the Alliance Against IP Theft, but nothing from the Open Rights Group or anyone else offering any counter-view. I wonder why, and I wonder if the BBC will update or alter the article at any point. Newssniffer’s Revisionista will let us know. Still, I can rest easy in my bed tonight knowing that those vicious pirates will be facing a tough legal crackdown to stop them copying data. Apparently, it’s also possible to legislate that pi=3. 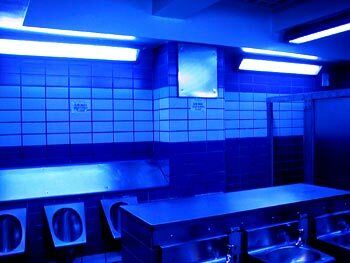 Blue lighting is sometimes used in public toilets (restrooms) to make it more difficult for drug users to inject themselves (veins are harder to see). The above implementation is in Edinburgh, next to the Tron Kirk. So the blue lighting ‘works’, but is it really a good idea to increase the risk that an injection will be done wrongly – maybe multiple times? This is perhaps a similar argument to that surrounding delibrately reducing visibility at junctions: the architecture of control makes it more dangerous for the few users (and those their actions affect) who ignore or bypass the control. This seems to be an architecture of control with the potential to endanger life, although the actual stated intention behind it probably includes ‘saving lives’. Without knowing more about addiction, however, I can’t say whether making it difficult for people to inject will really help stop them doing it; it would seem more likely that (as in the linked Argus story), the aim of the blue lighting is to move the ‘problem’ somewhere else rather than actually ‘solve’ it – as with the anti-homeless benches, in fact. 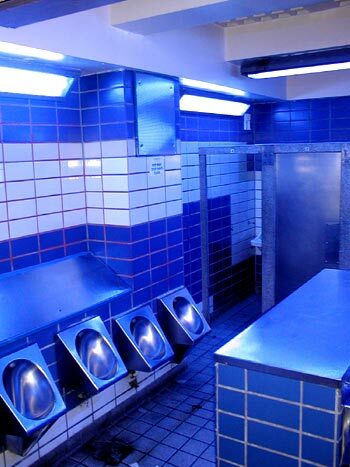 Another example in this kind of area is the use of smoke alarms specifically to prevent people smoking in toilets, e.g. on aeroplanes (the noise, and embarrassment, is a sufficient deterrent). There’s even been the suggestion of using the Mosquito high-pitched alarm coupled to a smoke detector to ‘prevent’ children smoking in school toilets (I’d expect that quite a few would deliberately try to set them off; I know I would have as a kid). A friend mentioned the practice of siting smoking shelters a long way from office buildings so that smokers are discouraged from going so often; this backfired for the company concerned, as smokers just took increasingly long breaks to make it ‘worth their while’ to walk the extra distance. What’s the excuse for the ‘No change given – Overpayment accepted’ policy? It’s not as though it’s technically too difficult to give change: these aren’t mechanical penny gobstopper machines from the 1950s. Sure, it would make each machine a bit more expensive to include the change-giving function, but so what? 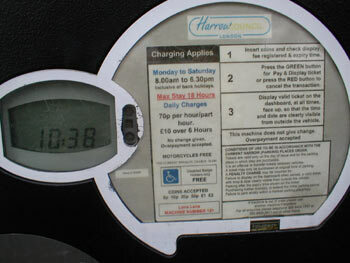 If every one of the hundreds of people who park each day paid, say, 5 pence extra the cost of the more expensive machine would be recouped within a week or two, surely? Of course, the real reason for the ‘no change given’ policy is that many customers who arrive at the machine without the 50p + 20p (or other combinations needed to make 70p) will put in Â£1 instead. 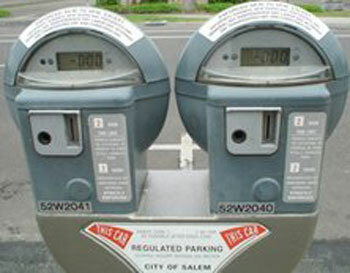 Thus for a certain percentage of customers, the machine receives 1.43 times the revenue it ought to. I don’t know how many people overpay, but the point is, none of them can underpay. The system is asymmetric. The house always wins. Does the car park operator (in this case Harrow Council) factor the extra revenue it receives from forcing overpayment into its projected revenues from the machines? Do they record how many people overpay, and use that statistic to plan next year’s budget? Or is overpayment treated as an ‘unexpected’ windfall? Or perhaps, just perhaps, without the overpayment the car park would make a loss? Any more examples of awful ‘no change given’ implementations, or related anecdotes, musings, etc, much appreciated!